Boating is back in full swing! That means hitching up the trailer and taking the boat to the launch ramp. Sometimes hitching up the trailer isn’t all that happens. I have completely redecorated my vehicle’s license plate while hitching up my trailer. When I had a tow vehicle with a steel bumper, this didn’t bother me so much. The unique license plate helped me positively identify my vehicle in large parking lots. I have a plastic bumper now, and those near misses don’t enhance the resale value of my vehicle so much. Talking to my squadron mates one day, the conversation turned to trailer hitching, and Hank Bateman suggested I try a set of hitch alignment indicators. Hitch what? Hitch alignment indicators are a pair of extendable metal rods with brightly colored balls on one end; they look like old-timey automobile radio antennas. At the other end of each rod is a magnet. 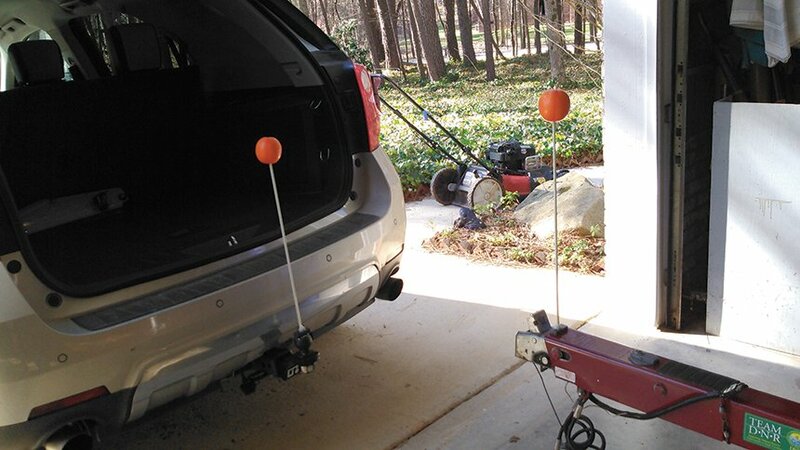 You place one indicator on the trailer receiver and the other on your vehicle’s hitch ball. Then you back up toward the trailer, keeping the colored balls aligned. When the indicator on the hitch ball falls off, the trailer receiver is directly above it. Then all you have to do is stop the vehicle, jump out, and lower the receiver down onto the hitch ball. Even if you are slightly off-center, the alignment is so much better than going by-gosh-and–by-golly that a gentle push will align everything perfectly. Wow! I began shopping for these miraculous things at my local marine and trailer specialty stores, as well as online. Do you know how much these commercially produced babies cost? Many friends and family members consider me a cheapskate, but two telescoping shafts, each with a tennis ball on top and a magnet on the bottom, for $11 to $30, was just a bit much for me. In my junk box, I found some fiberglass rods, which I’d used to stiffen or reinforce something. I saved them because I knew I’d need them down the road. They’re each about 20 inches in length. You can also use pieces from that fiberglass fishing rod your neighbor threw away, or the one you accidentally broke when you shut it in the car door. It will look better if you remove the guides from the fishing rod sections. I went to the dollar store and purchased the most expensive components of my project, the balls. They were a buck apiece. Next I bought a package of two rectangular ceramic magnets for $0.85. I have epoxy glue and putty, so I didn’t have to purchase those. If you have to buy them, you will probably spend another $2 or $3. This will leave you with enough money to buy a six-pack of your favorite adult beverage to consume as you admire your handiwork. To fasten the rod to the magnet, I used a popular brand of two-part epoxy. It claims a five-minute set time, and it’s a gel so it doesn’t run off the top of the magnet. I set a square next to the magnet to align the rod as straight as possible. I also used a small gadget with arms ending in alligator clips. Usually used for holding parts to be soldered, it holds parts to be glued as well. I then glued the rod to the magnet. Here, I have a couple of caveats. First, make sure you can see the indicator balls when you are in the driver’s seat and backing up. I have an SUV, and with the rear door a 24-inch rod is more than high enough to see. If you are backing a pickup truck with the tailgate up, you will require a taller rod. Second, the rods must be mounted 90 degrees from horizontal on the magnets. I don’t think I need to explain why. In a short time, the epoxy set, and I glued the balls to the top of the rods. Next time I hook up my trailer, I’ll put one indicator on the trailer’s tongue receiver and one on my vehicle’s ball hitch. I’ll align them and back slowly until the indicator on the ball is pushed off. Then I’ll know I can get out, lower the trailer and be on my way. Here’s to an undamaged bumper! 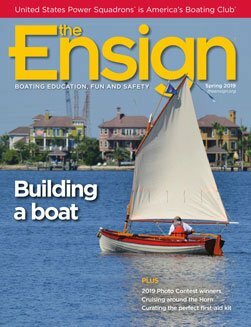 David H. Osmolski of Charlotte Power Squadron/27 has been repairing boats since high school when his first boat, a canvas-covered canoe with cedar ribs, leaked in gallons per minute and required constant repair.